The next two days will bring mostly clear skies and slightly less humidity due to weak northeast breezes. Rain chances may increase slightly on Sunday. Today and Tonight: Friday will be mostly sunny with slightly lower humidity. However, warm temperatures remain in the forecast with highs in the upper 80s. Friday night will be clear and a bit cooler with lows in the mid 60s thanks to light, northeasterly winds. Up Next: Pleasant, seasonable conditions will continue on Saturday. 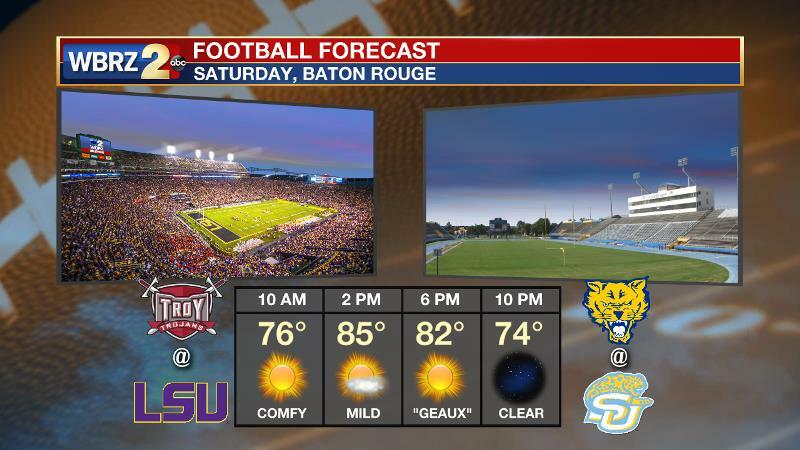 Outdoor plans, including LSU Homecoming and Southern on The Bluff, appear to be in great shape. Temperatures will be in the mid 80s during the afternoon and low 80s as the evening football games begin. As an F.Y.I. to allergy sufferers, ragweed and grass pollen will stay high. On Sunday, the afternoon brings a slightly better chance of an isolated shower or thunderstorm. Rain chances may even increase a bit more for Monday and Tuesday. This could be of benefit to local lawns and gardens as rainfall has been tough to come by in September. So far at Metro Airport in Baton Rouge, where records date back to 1930, only 0.08” of rain has fallen. The driest September occurred in 1953 when 0.09” of rain fell. Extending Baton Rouge area records back to the 1800s, September 1924 recorded no rain. Either way, a top two “dry” September is likely. The Tropics: Tropical Storm Maria is positioned 510 miles south of Halifax, Nova Scotia with a minimum central pressure of 987mb and maximum sustained winds of 60mph moving east at 21mph. Hurricane Lee continues to weaken in the central Atlantic as a category one storm with 75mph winds moving northeast at 25mph. Both systems are racing out to sea and pose no threat to North America. A disturbance near southeast Florida has a brief window of opportunity to organize before conditions become unfavorable. 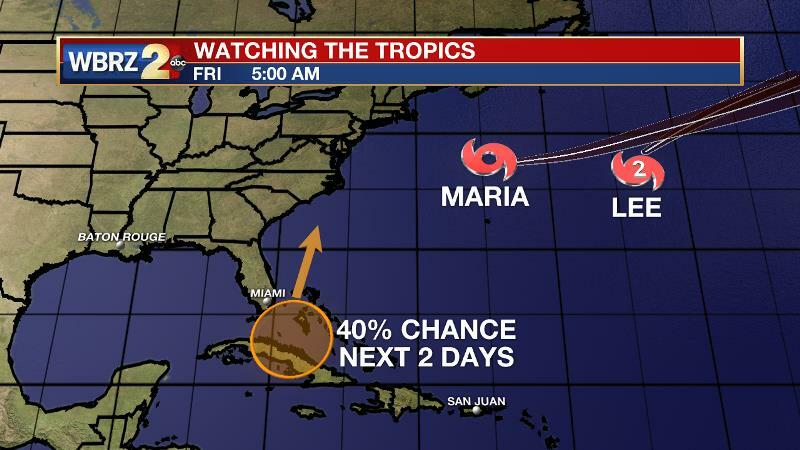 The National Hurricane Center gives a 40 percent chance of development over the next 2 days. Regardless, showers and wind will be possible in Florida and the Bahamas. As the southern Gulf of Mexico and western Caribbean Sea are favorable regions for tropical development this time of year and water temperature remains quite warm, we will need to keep an eye on those areas later next week and into the weekend. For more information on what may occur there, CLICK HERE. As a weak cold front has moved through the area, a mid-level ridge will build over the southeastern U.S. this weekend. As a result, warm and dry conditions are expected through Saturday. Into Sunday, moisture will start to increase as a weak inverted trough moves across the Gulf of Mexico. Rain chances will tick up a touch in response to this feature but ridging to the north should prevent widespread rain coverage. Monday and Tuesday will bring greater rain chances as easterly flow will be established across the central Gulf Coast. Weak waves of energy will move through this field and allow a bit more activity to develop. Then, the upper level ridge north of the area will become more expansive and spread over the region for the middle and end of the week, again dropping rain chances. The WBRZ Weather Team is here for you, on every platform. Your weather updates can be found on News 2, wbrz.com, Facebook, Twitter and the WBRZ WX App. on Apple and Android devices.